The 66th Annual Tony Awards was held on June 10, 2012, to recognize achievement in Broadway productions during the 2011–2012 season. The ceremony was held at the Beacon Theatre, and was broadcast live on CBS television, with Neil Patrick Harris as the host. Shows that opened on Broadway during the 2011–12 season before April 27, 2012 are eligible. Neil Patrick Harris was the host of the ceremony. This marked the third time that Harris hosted the Tony Awards show. The telecast had 6.01 million viewers (preliminary numbers), in contrast to the 2011 Tony Awards telecast, which had 6.950 million viewers. There were performances from musicals including Evita featuring Ricky Martin and Elena Roger, Follies, with Danny Burstein singing "Buddy's Blues" and introduced by Bernadette Peters, Ghost the Musical, Godspell, Hairspray (from a production on a Royal Caribbean ship), Jesus Christ Superstar, Leap of Faith with Raúl Esparza and company, Newsies featuring Jeremy Jordan and company, Nice Work If You Can Get It with Kelli O'Hara, Matthew Broderick and company, Once featuring Steve Kazee and company, and The Gershwins' Porgy and Bess featuring Audra McDonald and Norm Lewis. There also were performances from Tony-nominated plays, including End of the Rainbow with Tracie Bennett, One Man, Two Guvnors with James Corden, and Peter and the Starcatcher, with Christian Borle, Celia Keenan-Bolger and Adam Chanler-Berat. The Book of Mormon cast members, along with Harris, started the show by singing a version of "Hello". The original musical number that opened the show had Harris singing and dancing to "What If Life Were More Like Theatre?" with Patti LuPone, Amanda Seyfried, Jesse Tyler Ferguson, and company. The closing musical number was "If I Had Time," sung by Harris. Both the opening and closing musical numbers were written by David Javerbaum and Adam Schlesinger. As announced on June 1, Angela Lansbury, Candice Bergen, Jessica Chastain, Jim Parsons, Christopher Plummer, Tyler Perry, Nick Jonas, Amanda Seyfried, Paul Rudd, Ellen Barkin, Bernadette Peters, James Marsden, Mandy Patinkin, and Sheryl Crow, among others, were presenters. On June 7, Matthew Morrison, Josh Groban, and Cote de Pablo were added to the presenter line-up. Other presenters included Patti LuPone, Trey Parker and Matt Stone. Several awards, named the "Creative Arts" awards, were presented prior to the main televised ceremony as well as during breaks. These included awards for: Best Lighting Design of a Play, Best Lighting Design of a Musical, Best Sound Design of a Play, Best Sound Design of a Musical, Best Costume Design of a Play, Best Costume Design of a Musical, Best Orchestrations, Best Scenic Design of a Play, Best Scenic Design of a Musical and Best Choreography. These awards were announced by Norbert Leo Butz and Beth Leavel. The nominees were announced on May 1, 2012. The winners were announced on June 10, 2012. The Tony Award for Excellence in the Theatre has been awarded to Freddie Gershon, Artie Siccardi and the TDF Open Doors Program. Those awards were presented at the Tony Eve Cocktail party, held on June 9, 2012 at the InterContinental Hotel (Times Square). The Special Tony Award for Lifetime Achievement in the Theatre has been awarded to Emanuel Azenberg. Bernadette Peters was presented with the Isabelle Stevenson Award and Special Tony Awards were given to Hugh Jackman and the Actors’ Equity Association. The Regional Theatre Tony Award has been awarded to the Shakespeare Theatre Company. 1 2 Itzkoff, Dave (April 2, 2012). "Footnote". The New York Times. Retrieved 3 April 2012. 1 2 Ng, David (April 3, 2012). "Can Neil Patrick Harris boost Tony Awards ratings?". Los Angeles Times. Retrieved 3 April 2012. ↑ Gans, Andrew (January 17, 2012). "66th Annual Tony Awards Set for June 10". Playbill. Retrieved January 12, 2012. ↑ Healy, Patrick (January 17, 2012). "A Date for the Tony Awards". The New York Times. Retrieved January 17, 2012. ↑ Gans, Andrew (April 3, 2012). "Neil Patrick Harris Will Host 66th Annual Tony Awards". Playbill. Retrieved April 3, 2012. 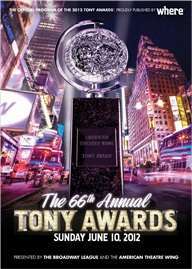 1 2 "The 2012 Tony Awards® to Feature More Performances Than Ever Before!". TonyAwards.com. June 7, 2012. Retrieved 7 June 2012. ↑ Gans, Andrew (March 12, 2012). "Recipients of Tony Honors for Excellence in the Theatre Announced". Playbill. Retrieved March 12, 2012. ↑ Gans, Andrew (April 10, 2012). "Emanuel Azenberg Will Receive Special Tony Award for Lifetime AchievemenEmanuel Azenberg Will Receive Special Tony Award for Lifetime Achievementt". Playbill. Retrieved April 10, 2012.